Kelly, Dumbrell and Pretty were among 4,000 people to take the once in a lifetime opportunity to run against the world’s best runners including winner and world champion marathon runner Haile Gebrselassie and Australia’s own Craig Mottram. HSV Ambassador Mottram crossed the line in fourth position – a commendable achievement for an athlete that usually specialises in the 5000m event. Before the event Mottram took time out to give the three V8 Supercar stars some last minute tips for making the distance. Kelly also shared a few tips on the start line from Kangaroos and Richmond AFL players. Kelly started off at the gun running the first 5km stint before handing over to triathlon enthusiast Dumbrell. A worn out Pretty finished off the final 5km before crossing the line to meet his team-mates. The HSV Clubsport R8 Tourer was out and about on the circuit leading the elite women and the field around some of Melbourne’s greatest landmarks including Flinders Street Station, Princes Bridge, the Tan – the famous running circuit around the Botanical Gardens, St Kilda Road and Albert Park. 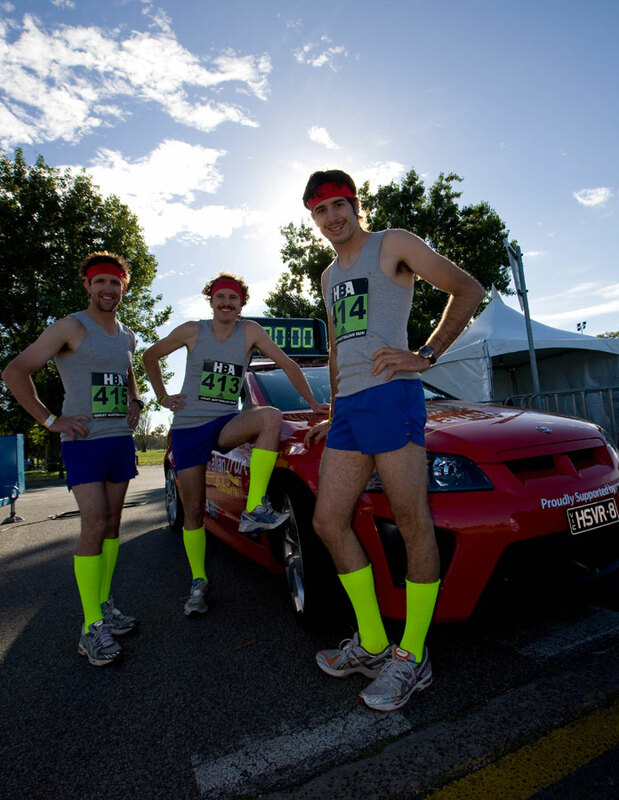 The three V8 Supercar drivers couldn’t be missed around the course, dressing up for the occasion with retro 70s leg warmers and headbands, to match their well groomed Mo’s and to help mark the end of Movember. While the V8 Supercar team may not have been the first team home they did manage to out run Melbourne comedian and Nova radio host Dave Hughes.